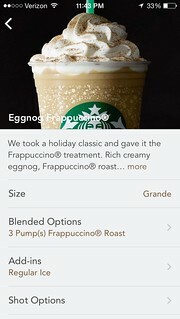 So my favorite drink is back at Starbucks: eggnog frapp. But it’s on the mobile app. 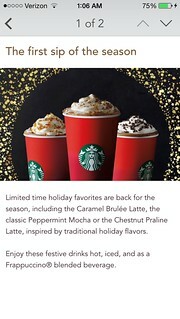 This is actually the second year they’ve had the eggnog flavor. Last year I watched them when they made the drink. And unlike other drinks, this one doesn’t have any syrup. 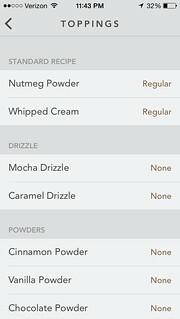 They actually add eggnog to the coffee/milk/ice mixture. I don’t remember they brand eggnog that they used, but I haven’t seen it before. It came in a white squarish container with green writing. I’m sure it’s sold at like Trader Joes or Wholefoods. I didn’t watch as my drink was made this time because my coworker asked me to order a drink for them. 😒 Thankfully there was only three people on line, so I didn’t have to wait at all. $17. I only found one in a target Starbucks, so I only have one. I really want 4. It’s currently in my car. I’m scared if I bring it into the house it’s going to get broken. A gust of wind is going to make it fall off the counter or something. It’s ceramic. If the cup dropped and broke I’d be highly upset. $17 is a lot to pay for a cup. It is currently 1am 11/07. I should probably be asleep, but I’m up writing this. And I’m not particularly tired. But it is my birthday. I’m not really going to do anything, because I’m not the celebrating type. The only thing I have planned is to go to a The Cheesecake Factory with my family, and friends. Oddly enough, before this year I hated going to the Cheesecake Factory. But I’ve gone there about 4 or 5 times already this year. And by now, I’ve grown to like one dish in particular. 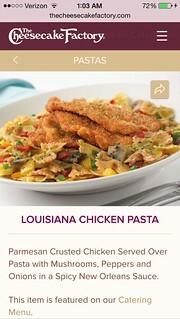 Louisiana Chicken & pasta. I’ll be honest and say I don’t really care for the chicken. It’s okay. The parts that are seasoned are really good, but the parts that aren’t taste like they aren’t. Aka they don’t have flavor. The sauce that is on the pasta is spicy. I don’t like spicy foods, but I love this. Once upon a time I planned on trying to make this myself. I got the recipe online, and I got as far as buying the pasta and the shrimp. But I didn’t buy anything else. Lol. Maybe one day soon. The only other thing I have planned for tomorrow, is going with my mom to Bonton. Apparently they’re giving out $20 gift cards to the first 200 people. They did it today also, but she didn’t know until 30 minutes after the store opened & decided that 200 people have probably walked in the store by that time… I’ve only been to Bonton once or twice, it seemed like a more expensive JC. Penney, or a Macys. 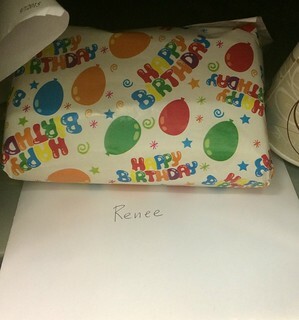 Thursday at work, my boss/friend gave me a gift and a card for my birthday. Normally, I emails from companies about free stuff, or coupons, one of the reasons I leave my emails with companies– I like free stuff. I got a $10 VS gc, which I may use tomorrow. I haven’t gotten my $10 gc from the Loft yet. It is possible that I’ll get it later in the day though. I do have my free pancakes at IHOP. I always end up wasting that coupon, because I don’t eat pancakes at IHOP. I always get the French toast. I think I have two weeks to use that coupon. I’m not complaining by any means. I said I only needed/wanted 6 for myself (and family). There was only 9 when I got to this. I did get to it an hour after she came in. So I assume she made 15 and the rest was taken by my coworkers. It is, what it is. 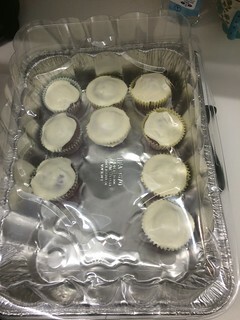 The cupcakes were finger licking good. But then when I turned 30, I was just like ‘eh. Whatever. It’s another day’. I guess o felt somewhat more better because although I still didn’t have any kids, or a husband, I was going to school with a purpose. And for the first time in about 3 years I don’t have school and homework to think about. I have a usable degree AND a professional license (well actually two, but they go hand in hand). I would love to say in working on the kids and husband, but I’m not. Hopefully I’ll have either one before I turn 33. 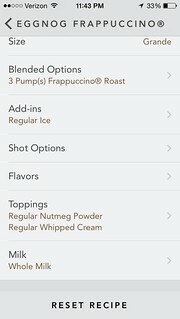 So the very first time I tried the Starbucks mobile order, I ordered the wrong drink, and I didn’t realize it until a few weeks later. 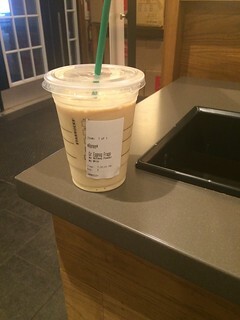 It wasn’t my fault though, because at that time all of the drinks weren’t on the menu (they didn’t even have a caramel frapp– which is my go to drink when I don’t like the seasonal drinks). 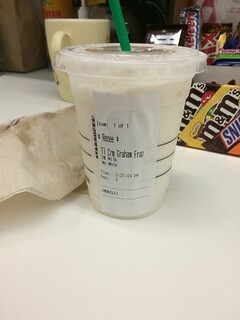 I decided to try the graham frapp for the first time, but I didn’t realize that there’s a ‘creme’ version of every drink. 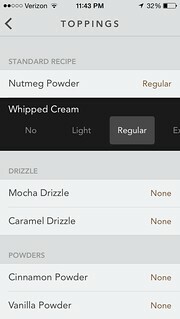 I believe the creme version adds a lot of milk and not as much of the coffee or flavoring. So when I get my drink, it’s a whitish color. I know right then it’s not going to be good. It literally tasted like milk with vanilla, sugar, and cinnamon. It wasn’t nasty, but as someone that doesn’t care for milk, it was too milky for me. 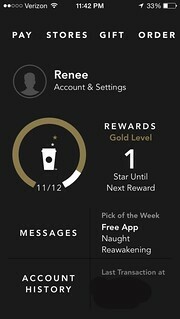 When I spoke to my fellow Starbucks junkie coworker she said the same thing. 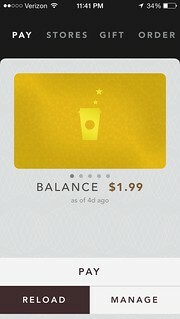 The main thing with ordering from Starbucks, is that you have to have a giftcard to pay for it. 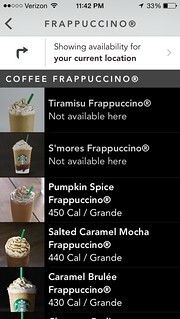 You also need the Starbucks app. 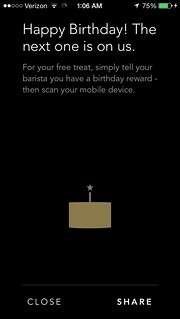 I’ve had the Starbucks gift card for a few years (I got one when they had a promotion- if you registered a giftcard, they gave you $5; they do that every so often) I actually have a gold card that has my name on it. 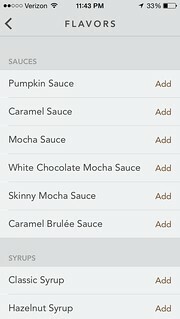 If you’re like me, and you have a bunch of drinks in the recents than you can click that & order it. Otherwise you can browse the menu. 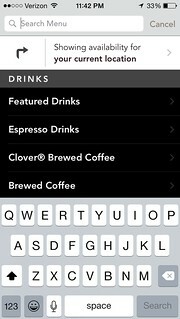 You can edit any drink you get. There’s a bunch of different options to choose from. 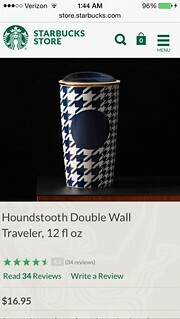 I’ve noticed with this a fully customized drink is more than one that isn’t (duh). For example, in the red velvet drink they have, they have java chips, which I don’t particularly care for. So I attempted to order that drink the way it is on the secret menu. (white mocha, w/ mocha & raspberry syrup) and I think it charged me $.25-$.50 more. So I changed the amount of java chips from 3 to 1 & prayed for the best. 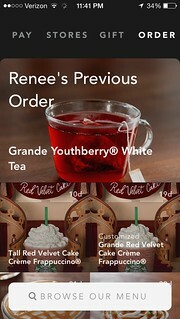 I did change the drink a little bedside the app just has mocha and raspberry syrup– which would taste like chocolate covered raspberries. 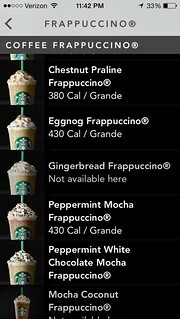 I chose to show the options with eggnog frap because that is going to be my drink until Jan. I ❤️ eggnog. Once you get your order together it will show you your total. You pay with your giftcard and it will tell you how much time you have before it will be ready. My store usually gives a 4-9 minute time frame. 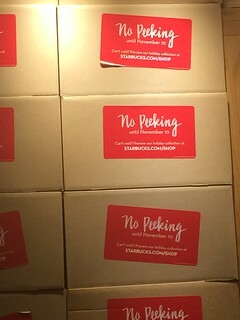 I think when we place an order the sticker comes out, and they put it in the line with the rest of the drinks. So now I don’t have to wait 30 minutes to order a drink now. Woohoo! 🎉🎉 if I order something like tea, I’ll order it as I’m walking there. It will be ready when I get there, since it takes two seconds to make tea. Going based on the baristas reaction, that has happened a few times. 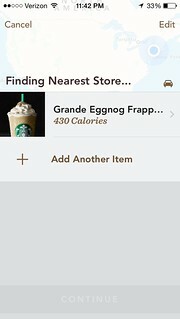 One of the flaws I see with mobile ordering, is that you can’t use a reward if you have one. I just feel like I can’t win with a Parfait bra. I haven’t come across one yet that actually fits me. 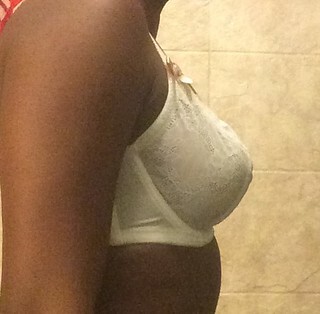 I have this bra in both black and white, and neither one fits me. 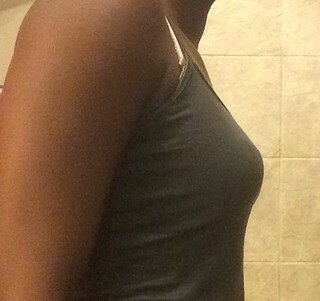 From the following pictures, the bra looks okay. A little bit of wrinkling, but still okay. This bra, however, was anything but comfortable. I wanted to rip it off as soon as I put it on! The band was tight, and I think that was causing the entire length of the wire to press onto my skin. The ends of the wire were poking my skin something serious. Needless to say, this is not a bra I’ll wear. I think you can see from this pic how tight the band is. It was so painful, I didn’t think about getting my bra extender. The top of the bra is somewhat closed off, so it doesn’t look too big, but there is space in the upper portion of the cup. But not enough space for me to size down. Not the best appearance with a cami on.